Following “Pandaboard Cloud Cluster Running Google App Engine” post, there were some questions regarding the actual power efficiency of ARM servers vs Intel (Xeon) servers and some commenters questioned the performance of ARM chips. I’ve found a thesis evaluating how the energy efficiency of the ARMv7 architecture based processors Cortex-A9 and Cortex-A8 compares – in applications such as a SIP Proxy and a web server (Apache2) – to Intel Xeon processors. 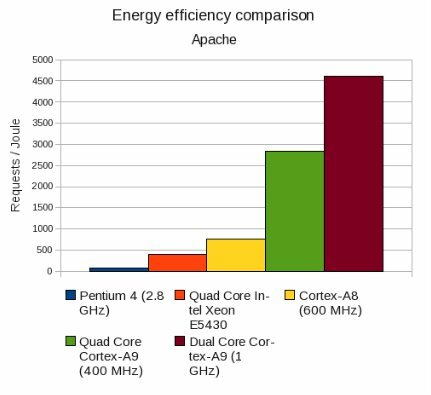 The focus of this thesis is to compare the energy efficiency between the two architectures rather than pure performance where the Xeon largely outperforms ARM processors, although a cluster of ARM servers could be used instead to reach the same processing power. Depending on the application, benchmarks indicate energy efficiency of 3-11 times greater for the ARM Cortex-A9 in comparison to the Intel Xeon. The full thesis (74 pages) is available below.